Easily create and handle disk images. Is there a better alternative to Diskonverter? Is Diskonverter really the best app in System category? Will Diskonverter work good on macOS 10.13.4? Diskonverter makes handling Disk Images easier. You can drag and drop Images or folders to convert, create or compact DMGs, ISOs and other Imags. Diskonverter relies on the Mac OS X Framework. Compact Sparse Bundles, in which you often create or delete files to save some space on your hard disk. Set the band-width of your self-made Sparsebundles. This is a great option when synchronizing DMGs for Mac OS X via one of the many cloud-services. This idea works only on Mac OS X! Check Read Only Images to correct some errors. This copies the checksum and check type to the Clipboard, e.g. for checking downloadable images. 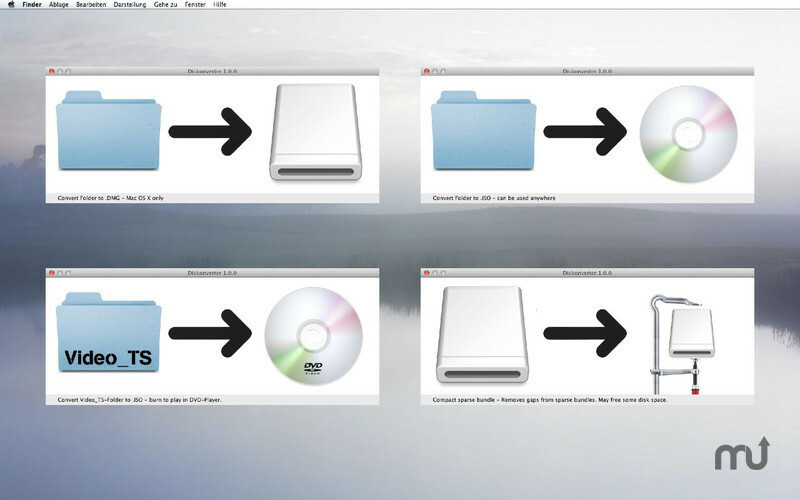 Extract the content of an Image to a newly created folder.